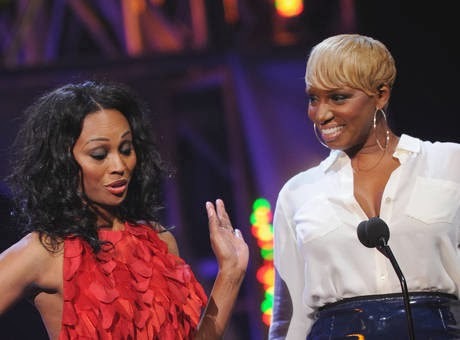 "Real Housewives of Atlanta" star Cynthia Bailey is loyal when it comes down to her friendship with bestie and co-star NeNe Leakes, but when it comes to her husband, Peter Thomas, she's not going to sit around and let insults fly. This week, Bailey took to her personal Bravo blog to address the incident, where NeNe called Peter a "b*tch" for involving himself in the drama surrounding [NeNe] and Kenya Moore outside Moore's charity masquerade ball. I was a little upset with Peter the next morning (after Kenya’s event) for confronting NeNe (although she actually confronted him), because I did not think it was the right time to talk. The night had already taken a turn for the worst, and I didn’t see the point in trying to fix something that was already broken. Had NeNe not gotten out of her car, walked over to Peter, and initiated the conversation with Peter, there would not have been a reason for him to be in her face acting like a b*tch, right? It was pretty clear that his conversation was directed to me. So I don’t know who the monster was that was waiting at the top of the hill, because the only thing that Peter was waiting for was his car to leave. I am beyond offended and embarrassed that one of my closest and most loyal friends called my husband a b*tch for speaking the truth. Not only is it blatant disrespect, it’s also dirty. It crosses the line, and hits way below the belt. A little surprising coming from someone who prides themselves on being such a GOOD FRIEND and the authority on who is not one. Moving on! I was so happy when NeNe and Gregg showed up at Peter’s party! The fact that my girl was able to take the high road and come to the party was validation that we indeed had a solid friendship and would always be able to work through our differences no matter how big or small. That’s what real friends do! FYI: Obviously I was not in her kitchen earlier that morning to hear her call Peter a b*tch. However, I thought it was big of her to come to his party despite her feelings at breakfast. Not to mention that she was even kind enough to leave NaeNae in the car! Long story short, it was a great party and I think everyone had a good time. The ladies had a chance to catch up and chit chat. The guys played pool and drank Jamaican beer. Kenya apologized to NeNe again. Peter and I kissed (amongst other things later on that night) and made up! Still kicking myself for not singing the Marilyn Monroe version of Happy Birthday for Peter at the party! LOL! It was kind of nice to not have any real drama for a change. Do you think NeNe should apologize for calling Peter a b*tch? Or was Peter wrong for getting involved in the ladies feud? PS: Kenya's charitable donation to NeNe's favorite abuse women organization, "Saving Our Daughters", was reportedly lost in the mail. The charity's founder claims he/she never received a dime!